There is nothing more transformative than makeup. It can make subtle features more prominent with a few swipes of product. And it can illuminate your favorite characteristics no matter how you plan on wearing your makeup – girls night out, Egyptian-inspired or simple and clean. Adding color will draw attention to any place on your face, but proper highlighting and contouring will do all the work and leave you with a polished finish whether you plan on wearing a bright hue on your cheek bones or not. No matter your style, after you’ve applied your foundation, use these tips to highlight and contour your way to a lustrous and defined face without having to go under the scalpel. Highlighting helps draw attention to your favorite features and brighten up those dark places that leave you looking tired or your lips looking drab. Once your base makeup is set, apply a highlighter stick like em cosmetics Chiaroscuro Contour and Highlighting Stick (it’s a dual use product) on the places that deserve more light. For most (myself included), that will mean underneath the eyes, around the edges of the nose and across the bridge, the edges of the mouth, the area between your brows and in the center of your chin. Then using a brush, a sponge or your ring finger, blend the product in. If you’re looking to define additional features, you can add a dab of highlighter along the brow bone to accentuate your arch and along your Cupid’s bow to create the illusion of fuller lips. Contouring adds dimension and depth to an otherwise flat face. Pick a product that has a strong color payoff so you don’t have to use a lot to achieve the look you desire. Your features should be defined, but not look like they are caked with bronzer. Begin applying product in areas that tend to have shadows on your face, or rather where you would like them to be. 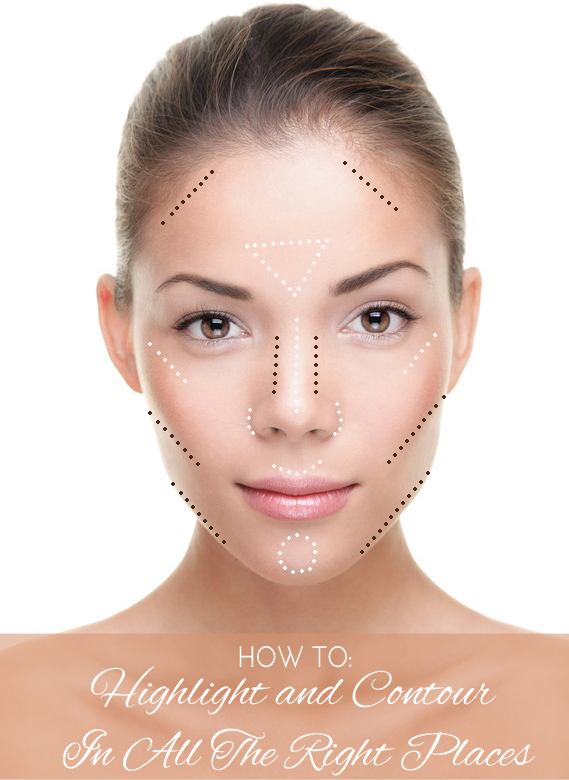 If prominent cheek bones are what you seek, then dab a contouring product on the hollows of your cheeks. Then smooth out for natural looking skin. Other places to contour include on each side of the bridge of your nose, along your hairline, and the base of your jawline. Together highlighting and contouring can truly change your entire look. You can have a thinner nose, cheek bones to be envied, and sun-kissed skin by simply lightening and darkening areas of your face. So give it a try and accent the features you want to shine!